Rita, a spunky, effervescent hairdresser (played by the charming, if too overeager, Whitney White), just wants to get a proper eduction. She’s looking to change herself. She also likes to change her clothes. 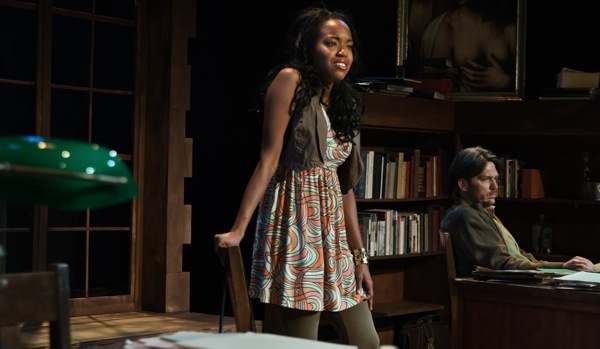 With each scene change in Shattered Globe’s halting production of Willy Russell’s episodic British comedy, comes a 30-second or more blackout for White to switch up her attire. And with the show clocking in at nearly three hours, by the final blackout/outfit change, my interest in the Pygmalion-esque relationship between Rita and her tutor-turned-accidental-life-coach Frank (the miscast but game Brad Woodard saddled with a distracting character wig) had nearly dissipated. At one point, I wanted to climb into Frank’s library liquor cabinet and pour myself a scotch to make things go a bit smoother. Perhaps you’ve seen the 1983 movie, starring Michael Caine and Julie Walters. I watched some clips on YouTube this morning. From the moment Walters’ Rita literally bursts on the scene, there’s instant chemistry between Caine and Walters. They feed off one another. While the two couldn’t be more dissimilar (Frank is an over-educated and highly cynical professor with a drinking problem, Rita is an unrefined, wide-eyed optimist with a hunger for learning and a love of swearing) they are each looking to redefine themselves and have found the means through each other. Why did I choose to watch clips of the movie now? Well, I just needed to ensure myself that it wasn’t the writing’s fault for the lack of chemistry in Shattered Globe’s production. While these are two fine actors, White and Woodard didn’t really connect for me until somewhere in act two, where stagey line readings and frantic energy are finally pushed aside for grounded, honest performances. But leading up to that, White’s energy is so off-the-charts, and Woodard’s Frank is so underplayed, it feels like they’re in two different shows. And with the clunky scene changes interrupting things, it makes for a weary evening. Still, Russell’s hilariously biting examination of higher education, and the hallow pretentiousness it can lead to, comes through loud and clear, despite Shattered Globe’s uneven production. I would like to first say that this was a great first experience for me. This play really hit home. It was about someone who realized that life was supposed to be meaningful. I disagree with “Bob.” You need to look past the “wig” and really can’t compare this to a movie that was fully funded. There was a very cute attraction in these two characters that could have become so much more but one or the other held back from the others playful banter. I thought when I sat down “how can they do a play with just one set?” I don’t know the first thing about theater, but this play kept me interested till the end. The ending is an ending everyone will appreciate, one where everyone’s point was made and understood. Oh and yes there was outfit change after outfit change but that was the point to show how every week went by and the changes Rita had made with herself. Maybe it was because I am female but I couldn’t wait to see her next outfit. They were perfect with her change of personality. This play hit home with me. I choose to start my family early but now at thirty I am still trying to find myself and for a girl her clothes are a way to find that personal touch that shows others the type of person she is. Oh and Rita’s tutor Frank was perfect. His facial expressions where all he needed to do through the whole play. Those where what made the watcher know what was going through his mind as he was watching this girl grow from start to finish. I loved the want in his eyes for Rita’s need to become more and for the wants of the flesh that came through also. I believe that want and playfulness in Frank helped her to come back week after week to make her goals a reality. It always helps to come back to someone who truly wants your presence and who does not mock you for the ignorance you think you are displaying. This play was “LMAO” funny and very down to earth. A “Rita” like me could walk into this play and relate to it. I LOVED IT!!! I hope that others will go and see it for themselves and look past the lack of funding and just watch the actors act out this magnificent play. Thanks for reading and commenting, Trieste. It’s great that you were so moved by the play based on your personal experiences. I’m sure others feel the same way you did about this play. Your comment, Trieste, has somehow convinced me to watch this play. Honestly, these theater actors deserve more recognition. Unlike movie actors that can have several takes on a particular act, stage actors have to be accurate and specific on what they do as there’s no take two. I’m glad you’re checking out this production, Chicago Girl! Thanks for reading. Next Post A mouth-watering preview: The New Colony’s ‘Five Lesbians Eating a Quiche’ opens tonight.